Gravity is a French metal band that was founded in 2009. They have been working very hard since the beginning so that their debut La Quadrature du Cercle came out already in mid 2010. As they were still brimming with ideas, the second album Syndrome followed quickly in early 2011. Even though English has become the de facto language in the international rock business, the quintet decided to stay with their mother tongue. Their music sounds very modern and combines contemporary genres like melodic death metal, metalcore, black metal and psycore into quite an impressive amalgam. Gravity’s focal point is without a doubt vocalist Emilie, who doesn’t only strike the eye with her fiery red hair, but also has an extremely raw voice that you’d normally expect from bands like Holy Moses and Arch Enemy. It would be wrong to dismiss them as copycats, as Emilie always surprises again with soprano parts that work surprisingly well. The complex songwriting doesn’t need to hide behind the frontwoman and reveals new nuances with every listening experience. A lot of time is spent on alternating dark with fast parts, inserting all the while a whole lot of playful parts consisting of drama, pathos and occasional fierce thrash attacks. All of the featured tracks are great in their own right, but some deserve even more to be pointed out. The dragging Part 2: Déphasé has nice parallels to Neurosis, and Elle fascinates with bizarre piano parts. The slower instrumental which concludes the album is a nice way to get the listener grounded again. 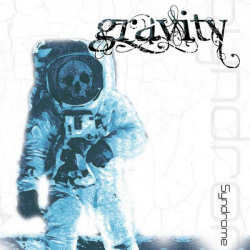 Gravity have delivered with Syndrome an impressive album that covers many different faces of metal. Those who like extreme and demanding music should invest one hour into this excellent album. I am sure that you will come back for more.